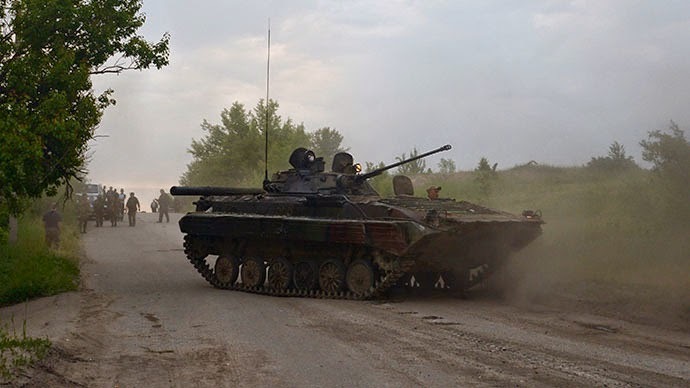 Image: Armored vehicle operating in Lugansk, eastern Ukraine..
May 23, 2014 (Tony Cartalucci - NEO) - The regime in Ukraine is rushing forward with elections, supposedly to take place on May 25, even as much of the country descends into chaos. With Crimea now part of Russia, and two more provinces declared autonomous after recent referendums - with more provinces to follow - Kiev has responded with a campaign that resembles more of a foreign invasion and occupation than a national security operation. With its regular army in shambles, Kiev has turned to a patchwork of militias, ad hoc mercenaries, armed gangs, and has even tasked loyal corporate-financial oligarchs with raising and deploying private armies of their own. The results is predicable mayhem and can be seen playing out most acutely in the breakaway province of Donetsk in Ukraine's east. Recently militants, militias, and even helicopter gunships clashed near the town of Volnovakha leaving up to 16 dead. Conflicting reports are emerging from the clash, but statements from both sides and video taken of helicopter gunships strafing what remained of an ambushed convoy of troops from Kiev depicts the regime engaged in a desperate and losing battle. A dawn attack on a checkpoint in eastern Ukraine has left at least 14 soldiers dead, in the worst loss of life for government forces to date. Heavily armed militants attacked the checkpoint in the Volnovakha area, in one of four attacks reported overnight in eastern Ukraine. It is unclear who attacked the checkpoint, with one Ukrainian officer telling the BBC it was not separatists. 16 Ukrainian troops were killed and over 30 injured in an attack on a military checkpoint in Donetsk Region. The deadliest assault on the army since Kiev launched its military operation in the south-east of the country comes a few days ahead of election. The checkpoint on the edge of Blagodatnoe village, near the town of Volnovakha, was assaulted on Thursday night. Eyewitnesses told Russian Chanel One that the attackers arrived in transit vans, with armored vehicles and combat helicopters providing cover for them. The gunmen set fire to the military’s armored vehicles and began shooting at the rookie soldiers, who had their encampment near the checkpoint. RT also provides two videos - one showing gunships at low altitude approaching the scene, and another of the aftermath of the attack. An additional video has surfaced showing the gunships strafing the convoy as Kiev troops huddle behind a troop transport truck in confusion, radioing in for confirmation as to why they are being attacked by their own air support. Several theories are emerging from the incident. One is that the troops refused orders from Kiev and were attacked by local mercenaries raised by oligarchs loyal to Kiev. Another incident in Lugansk appears to also have involved Kiev troops opening fire on their own who refused orders. While the West attempts to blame Russia for the deaths, no theory has been offered by the US State Department or its echo chamber within the Western media as to how or why Russian gunships would have penetrated so far into Ukrainian airspace for a single attack. These incidents highlight Kiev's inability to govern a country that its own belligerence is playing a key role in breaking apart. Despite the dangerous deterioration of Ukraine's sociopolitical stability, it is rushing ahead with elections, with full backing from the West who already has its compromised "election monitors" in place to declare whatever takes place on May 25, "free and fair." Image: Armed thugs in mismatching uniforms, identified by TIME as "national guard," blocked a polling station during Donetsk's recent referendum. The blood on the ground is from one of two unarmed voters TIME reported were killed while attempting to cast their ballot. Both TIME and the US State Department have attempted to justify the violence by claiming the referendum was "illegal." . Perhaps most ironic of all is the fact that troops in the streets across Crimea when it held its historic referendum was cited by the West as one of many reasons the referendum was "illegal." It appears, suddenly, that not only troops, but ongoing armed clashes, is no longer an obstacle for polling to take place - as long as those armed are loyal to the regime in Kiev. 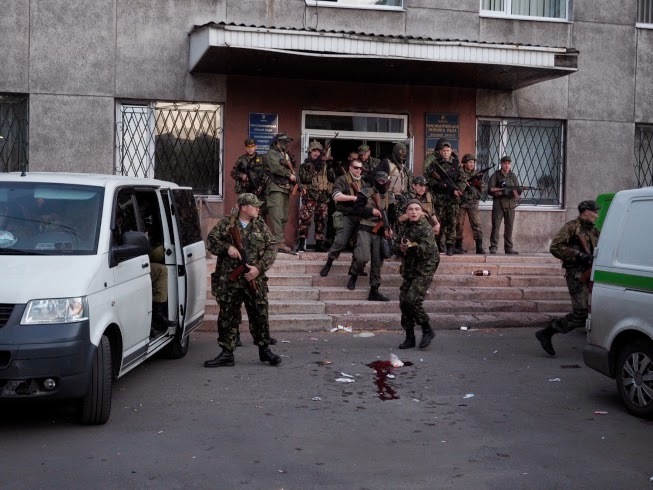 Fears that anti-Kiev forces will disrupt the elections were suspiciously absent when armed thugs attempted to block polling stations in Donetsk during a recent referendum and began shooting dead unarmed voters. TIME magazine, in their "lightbox" section would feature a polling station blocked by armed militants wearing mismatching uniforms who beat and began shooting voters - at least two of which were killed. In another development, residents of a village near Sloviansk, a town in Donetsk often seen as the separatists' stronghold, complained of shelling that appeared to come from government positions. As Kiev troops surround and shell populated centers in Donetsk, the West is not only failing to condemn war crimes it condemns elsewhere - including in Syria where it is trying to involve the International Criminal Court (ICC) - it is insisting that the regime carrying out these crimes in Ukraine should be allowed to hold and contest elections just days away. Biased reporting has been the mainstay of special interests across the world and throughout history. However when such hypocrisy and systematic distortion works its way into a nation's foreign policy, the entire political system and that nation's ability to associate with others internationally is put in jeopardy. It is certain that elections in Ukraine will not solve the ongoing conflict, and very likely they will in no way even help the West advance its agenda in Eastern Europe. They will however further undermine and compromise the concept of Western-style "democracy" and all the institutions, organizations, infrastructure, and participants arrayed to perpetuate it. In the process, the crisis in Ukraine will only spread and intensify, costing many their lives undeservedly on both sides while the West pursues its ill-conceived extraterritorial agenda in Eastern Europe.